The Galapagos Islands were first discovered by the Spaniards as they were sailing to Peru in 1535. The archipelago offers 100 percent nature and adventure, with basically nobody else around. In this Destination Guide article, Christelle and Rodolphe Holler, co-owners of Superyacht Private Expeditions, share their experiences and recommendations for where to go in the Galapagos Islands, especially to thrill in underwater adventures. The 20 volcanic islands of the Galapagos Islands are part of Ecuador. These desert-like islands have remained protected from the rest of the world and host an incredible number of endemic species. 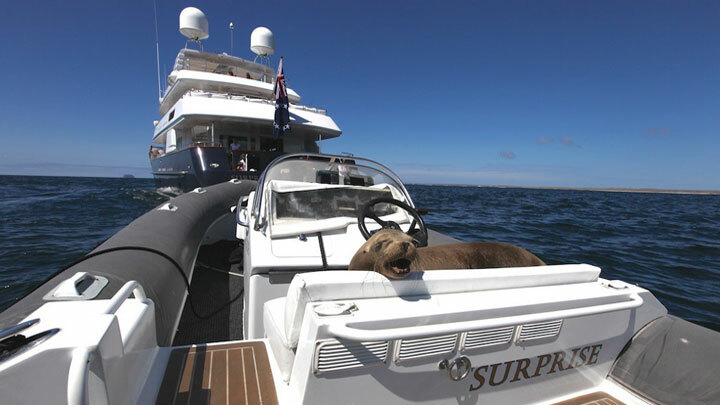 Therefore, many restrictions apply when arranging a superyacht cruise to the Galapagos Islands. The islands are totally unspoiled, and you’re not allowed to set foot on some of them for conservation purposes. Ninety-seven percent of the territory is a natural reserve. You will easily feel in Charles Darwin’s shoes when exploring. You’ll fly through mainland Ecuador (Guayaquil or Quito) before flying to the Galapagos Islands. The international airport is on a small desert island named Isla Baltra. After going through immigration and customs, you will be driven south to the narrow channel separating Isla Baltra to larger Isla Santa Cruz. Here, your yacht tender will wait for you to take you to the superyacht’s anchorage nearby. Charter is not allowed; only private cruises are, with a maximum stay of two weeks with guests onboard. Superyachts are allowed to stay longer with the crew only (who need no special visas, just the same ones as tourists). Your itinerary needs to be set in advance and is subject to the agreement of the local authorities, who will provide cruising permits. You must have a local guide, too, for the entire trip. This allows little flexibility but is definitely worth it. The Galapagos Islands’ main interest is under the water. We suggest an 11- to 12-day trip, with must-visits being the remote islands of Darwin and Wolf, north of the Galapagos archipelago. Only a few vessels at a time are allowed, however, and you must charter a local support vessel to be granted access. Even though this represents extra expense, planning, and logistics, we really recommend both places. The water temperature is between 66 and 75°F (19 and 24°C) with usually very good visibility. Most superyachts go between December and May during “the warm season.” It is usually more sunny with no wind. Even though the temperature is basically the same year-round, the “cooler season” is June to November. It is likely to be a bit more overcast and windy (southeast trade winds). The diving is good year-round. Isla Santa Cruz is the only island where visitors can readily experience the interior of the Galapagos Islands thanks to a few paved roads and villages. Drive to the Tortoise Reserve. 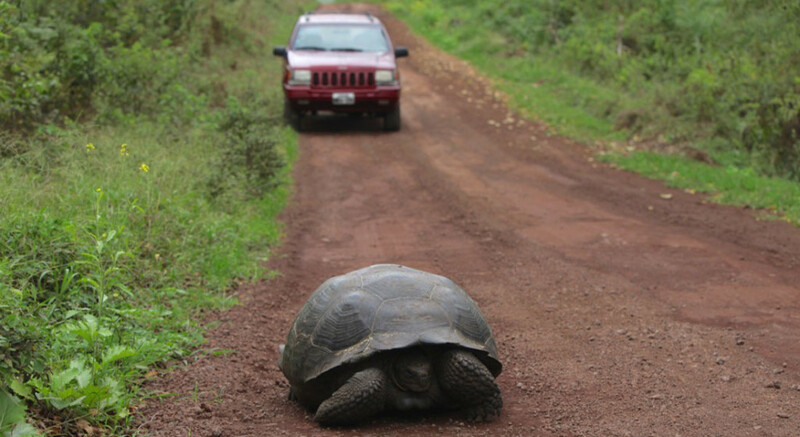 Along the way, you are likely to see wild giant tortoises wandering along the road, and even sometimes in the middle of the road (above). Wait until it has finished crossing! The reserve enables these endangered species to be looked after in their own environment, with no enclosure. Later, take a tender ride to the nearby mangrove, north of Santa Cruz. Marine birds and sea turtles will greet you. Your superyacht cruises to small Isla Mosquera, just north of Baltra Island, and anchors south of nearby Isla Seymour Norte, a.k.a. Seymour Norte Island. It’s a great place for a hike and to encounter numerous land iguanas (up to about 5 feet, or 1.5 meters, long), blue footed boobies, and great frigate birds. The males have a beautiful bright red throat, which they inflate when looking for a mate. Go for a refresher dive at Daphne Minor, 3.7NM west of the anchorage. It will give you a very nice taste of what the Galapagos Islands have in store for you during the rest of your trip! The perfect anchorage is close to Isla Bartolome (east). 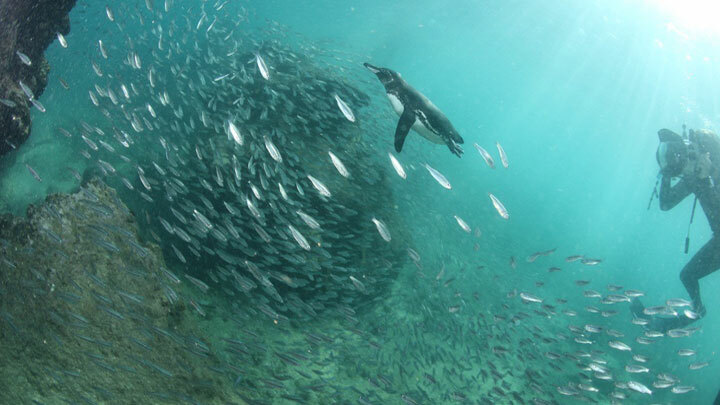 This is the place to snorkel for hours with friendly penguins (above) hunting in safe, shallow water over a rocky bottom. It is the only penguin species found in the northern hemisphere. After lunch, hike close to the shore facing Isla Bartolome and witness spectacular lava formations, where you can hide, climb… You feel like you are on a different planet. The volcano erupted for the last time 300 years ago and left the island bare of any vegetation. This huge rock will only be a stopover for a two-tank dive. There’s strong chance to see hammerhead sharks. Roca Redonda lies over a big underwater volcano, still active, and you will see many small bubbles rising from the bottom as the result of the important geological activity in the area. Isla Isabella (Isabella Island) was recently in the news due to its volcanic eruption. The top of Isla Isabella, south of Roca Redonda, has a seahorse shape. We arrange two-tank dives here, which has colder water due to the upwelling current. You’ll dive with plentiful and often quite curious sea lions (aabove), encounter huge and rare sunfish, and see a few marine iguanas eating sea grass for lunch. The anchorage is at the northeast point of the island. Start the day with a dive with seahorses and many marine iguanas. They are tame and do not mind divers around them. In the afternoon, take a walk and encounter the island’s inhabitants: sea lions sunning and resting, iguanas… They are in such large numbers that you could step on them. They will certainly not move to give you way and will simply ignore you as you pass them! You’ll also discover the endemic and unique flightless cormorant. Due to the lack of predators and as food was available from the shore, it is the only species of cormorant which cannot fly. It is, however, an amazing diver when hunting in the water. Take your snorkeling gear and follow the hunt for a must-see. Your superyacht will cross at night to the best anchorage west of the island. Sheltered, it is very scenic, with impressive steep cliffs surrounded by thousands of sea birds. Wolf Island can only be visited with a private yacht if a local charter boat is hired and only upon permission for a limited time. Setting foot ashore is strictly prohibited. Remote from the rest of the archipelago, Wolf, like Darwin Island, is as pristine as it was centuries ago. This is a great place to encounter hammerhead sharks. There are so many fish that it is sometime difficult to see your dive buddy next to you! Eagle rays, mobula rays, and sea turtles will come under the boat, and you can snorkel with them. The anchorage lies on a sandy bottom, where you can discover the rare red lip batfish, which definitely looks like it’s wearing lipstick! The anchorage is likely to be a little bit rolly, but safe. Darwin Island isn’t as scenic as Wolf Island in terms of anchorages, and again, you are not allowed to set foot ashore, so the main interest is underwater. Darwin Island features what we would qualify as the most impressive dive in the world out of all the areas we have visited before. 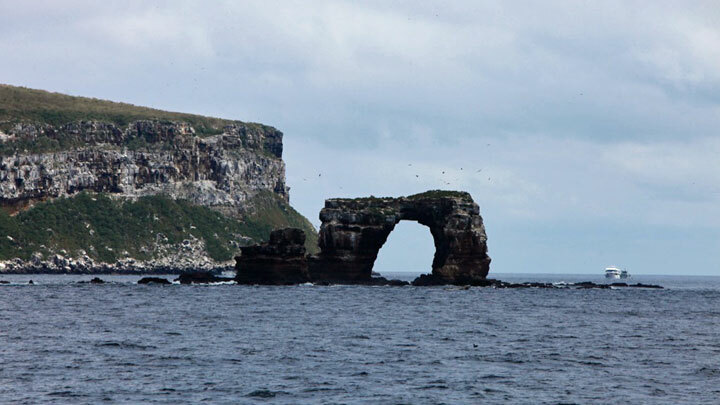 The dives are arranged close to a beautiful natural rocky arch southeast of the island. While Wolf is an excellent teaser for hammerhead sharks, Darwin has hundreds of them! From June to November, massive whale sharks congregate around the arch, too. You can arrange several dives around the same spot, and it will always be as amazing. You will feel privileged to witness such beautiful marine life and to swim among endangered species. You’ll see many dolphins, too. Your superyacht will stop at Wolf on the way back for last dives around the Galapagos Islands before heading back to Santa Cruz. The yacht travels back to Isla Santa Cruz. On your last day, explore the famous lava tubes, in different areas of the island. They were formed when lava cooled and solidified. To date, a lot of them are still unexplored and are believed to be home of unknown dark-adapted species. Take a quick visit of the main village Puerto Arenas, and hike to beautiful Tortuga Bay. It features a beautiful white-sand beach. It’s great for surfers and is an excellent spot to encounter sea lions, iguanas, and sea birds. It is a very nice way to finish your stay in these unusual islands.